I think I’ve got this pre-run breakfast-thing down. Steel-cut oatmeal and a mini-latte treat my pre-run tummy good. 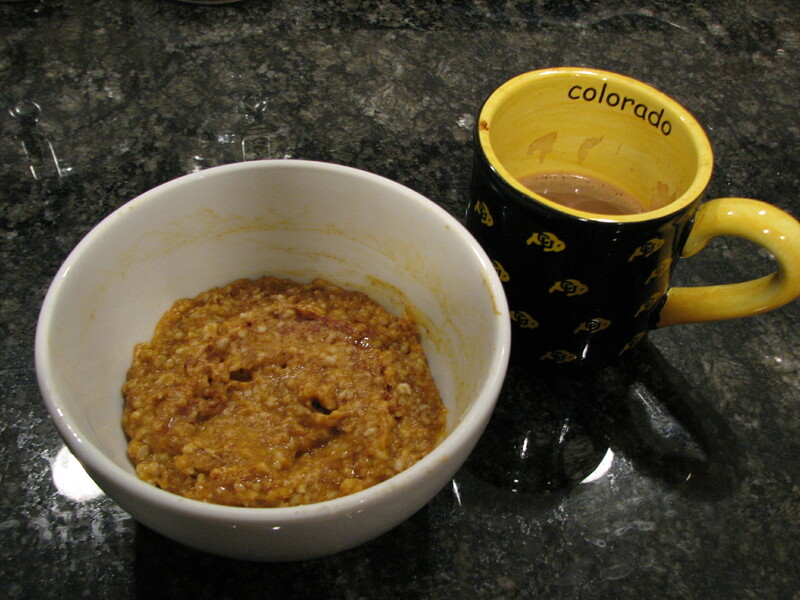 Also, the oatmeal's so tasty, I had to eat some before taking this picture. My quest to find new, healthy, easily digestible pre-run breakfasts started back in December, motivated by gastrointestinal distress during the Marine Corps Marathon Oct. 25. It wasn’t my pre-race breakfast that caused my problems, but I thought it might be a good time to examine my typical Luna bar/espresso with a little nonfat milk combo. Via Twitter and comments on the blog post I wrote about it, you gave me some wonderful suggestions, and after months of experimentation, I’ve found my new favorite: oatmeal with banana. Most recently, that has meant steel-cut oatmeal, made using the overnight shortcut described in this recipe at The Bitten Word (you boil the oats and the water the night before, let the mixture sit overnight, then cook for just a few minutes in the morning). On running mornings, I eat it with a banana diced and mixed in, plus a little Splenda and vanilla. On non-running mornings, I replace the banana with canned pumpkin and pumpkin pie spice. Add some sugar-free maple syrup, and it tastes like dessert. Other insights: If I’m really planning on a hard workout, I need to eat my last substantial meal three hours before running, not one. Also, my mini latte — a shot of espresso, with roughly a third of a cup of nonfat milk —seems to work OK (whew!). But I need some help again. This oatmeal revelation is great for race-day mornings. But during the week, I run at 7 p.m. with Pacers Silver Spring’s running group, which leaves me wondering: What’s the perfect pre-run lunch to fuel up for a nighttime run? I understand that I can play it *really* safe by eating a peanut butter and banana sandwich; or, you know, oatmeal. But that seems a little extreme for something I do on a twice-weekly basis. So I’m looking for something tasty and healthy (i.e., something I’d eat anyway); light enough to not be sitting in my stomach at 7 p.m.; but substantial enough to keep me full, with the help of a small pre-run snack, until after my run is done. If you’ve got lunch suggestions, or general guidelines that have helped you avoid GI distress, by all means, post ’em below! Last workout: A hilly 5.3-miler completed at 8:33-minute-mile pace with Pacers. I would have preferred to see closer to 8-minute miles on my Garmin, considering my effort level, but I’ll take it, especially considering this is way faster than I would have gone on my own. Next up: I’ll be running through my new physical therapy workout today, and attempting a quick treadmill speed workout before our weekend shift at Whitetail tomorrow. Wish me luck! hope that helps! Oh, I usually have a yogurt too. Protein + calcium + I heart yogurt. Well, it seems like the steel-cut oats sits well with your stomach. Have you tried quinoa? It’s another grain that is easily digestible. There are quinoa flakes as well (I make a hot cereal from those some mornings) that can be used to make a “quinoa pudding” or other some easily digestible lunch. Maybe a quinoa salad with some cooked veggies thrown in? I’ve been curious about quinoa — that may have to be my next experiment! Any recipes you like in particular?